Murder and manslaughter charges are extremely serious. An experienced attorney is absolutely necessary in the event you are charged with these crimes. The killing of another person, whether intentional or not, is known as homicide. There are several different types of homicide under Michigan law. Most include some form of intent, though others only require some measure of negligence. For instance, murder occurs when someone consciously attempts to kill another person (with intent), but manslaughter is usually an accidental killing (through negligence). 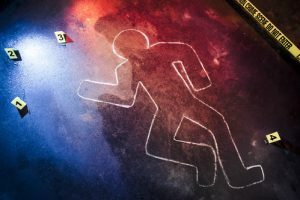 The different types of homicide in Michigan include first and second-degree murder, delivery of a controlled substance causing death, and voluntary and involuntary manslaughter. If you need assistance with any type of homicide charge, please contact Michigan Justice immediately at (586) 221-4100. Michigan defines first degree murder as a killing “perpetrated by means of poison, lying in wait, or any other willful, deliberate, and premeditated killing.” This means that the murder was done intentionally, and the person thought about committing the murder before carrying out the act. In 2015, Kierelle Burns purposely shot and killed his friend in an alley in Muskegon. To lure his friend to the alley, Burns created a fake robbery plot with the sole intention of murdering his associate. In creating this charade, Burns was acting with premeditation. Many people believe that “premeditation” requires careful planning and forethought, much like the Burns case. Although this may be true, according to Michigan law, premeditation may take place in just a matter of seconds. Michigan also devotes a special first-degree murder law to the killing of “peace” officers. Under this law, a peace officer is any police or conservation officer in Michigan, the United States, or any other state or political subdivision (such as a county or municipality). If a murder of a peace officer is committed by a person who knows the they are an officer and on-duty, the crime is first degree murder. A prominent example of this occurred when Raymond Durham was charged with “murder of a peace officer” in the 2016 killing of Wayne State University Police Sergeant Colin Rose. Durham was charged with this crime because he shot Sergeant Rose while he was officially carrying out his duties as a Wayne State University police officer. Felony murder is also considered a first-degree murder offense under Michigan law. Felony murder is any death (whether intentional or not) that occurs while committing, or attempting to commit, another felony. Felonies listed under Michigan law for felony murder include: arson, criminal sexual conduct, first degree child abuse, a major controlled substance offense, robbery, carjacking, breaking and entering a home, larceny, extortion, kidnapping, vulnerable adult abuse, torture, aggravated stalking, or unlawful imprisonment. The penalty for any first-degree murder conviction is life imprisonment without the possibility of parole. In 2017, Michigan State Police trooper Mark Bessner was charged with second degree murder for shooting his taser at Damon Grimes, a teenager who was riding an ATV. The ATV crashed, and Grimes was killed. Under Michigan law, second degree murder is an unplanned but intentional killing, or any death caused by reckless disregard for human life. Essentially, second degree murder is anything that does not rise to the thought-out level of first degree murder—the crime is defined by lack of premeditation and sheer disregard for human life. When charging Trooper Bessner, prosecutors alleged he created a very high risk of death by firing his taser at a moving ATV while the trooper was also in a moving police vehicle. Trooper Bessner did not plan to kill Grimes but he intentionally caused his death through his reckless actions. The penalty for second degree murder could be any term of years in prison, up to and including life imprisonment. Under this section of Michigan law, if someone delivers a schedule 1 or 2 controlled substance (other than marijuana) to another person and causes death, that person is guilty of a felony punishable by imprisonment for any term up to, and including, life. Schedule 1 and 2 controlled substances are dangerous drugs. Included in these schedules are narcotics such as heroin, LSD, morphine, opium, codeine, and methadone. If the controlled substances are delivered lawfully under Michigan’s Public Health Code, (i.e. through prescription) this law would not apply to any death that occurred as a result. The penalty for delivery of a controlled substance causing death includes any term of years in prison, up to and including life imprisonment. There are several different types of manslaughter in Michigan. These include both voluntary and involuntary manslaughter charges. Voluntary manslaughter occurs when a someone intentionally kills another person. This is commonly due to an emotionally charged situation, where the intention to cause death existed, but there was no clear premeditation for the killing. Additionally, the killing must not be after the attacker has had time to “cool off” emotionally. For example, voluntary manslaughter charges sometimes originate from out-of-control domestic abuse situations: A husband is attacking his wife and she defends herself, but in a moment of passionate anger she kills her husband. Although she intended to kill him, she did so in “the heat of the moment” and without any cooling-off period. As a result, she would likely be charged with voluntary manslaughter rather than murder. On the other hand, involuntary manslaughter is the unintentional killing of another person due to criminal negligence. This charge often accompanies cases of infant death because of parental negligence or vehicular deaths resulting from a DUI. For instance, a person gets drunk at the bar and decides to drive home—an all too common real-life occurrence. On the way he hits someone with his car and kills them. The drunk driver never intended to kill anyone, but his extreme carelessness still caused a death, so an involuntary manslaughter charge is appropriate because of his criminally negligent behavior. Homicide charges are very serious and so are the penalties if you’re convicted—you could spend the rest of your life in prison. At Michigan Justice, we fight for our clients using comprehensive and thorough criminal defense strategies. If you need assistance, please don’t hesitate to contact us at (586) 221-4100. The head of our criminal defense department, Goran Antovski, is an accomplished defense attorney and has had many cases for and with the Macomb County Prosecutor’s Office. He and the Michigan Justice team will rigorously and steadfastly defend your rights and provide the best possible outcome for your case.